As you step into the city of Haridwar you’ll be welcomed with the chimes of the temple bells and the religious chanting of the priests. 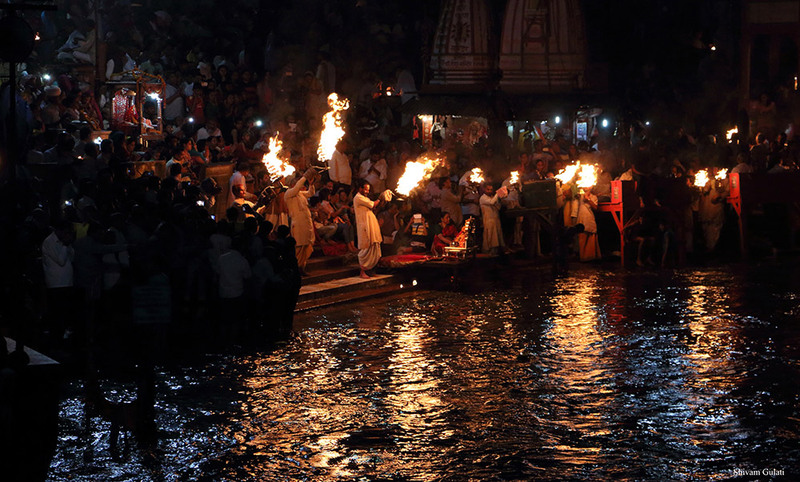 The city has a religious significance as the holy river Ganga enters the Indo-Gangetic Plains of North India for the first time in Haridwar. Thereby making its former name 'Gangadwara' perfect in every sense. Revered as one among the seven holiest places of India, Haridwar that literally suggests the ‘Gateway to Lord Vishnu’ is cradled on the banks of river Ganga. Haridwar is also spelled as Hardwar or Hari-Dwar. Haridwar is often mentioned in ancient scriptures and even referred during the British times. With Ujjain, Nasik and Allahabad, Haridwar forms the four important pilgrimage centres of India where Kumbh Mela is celebrated here after every 3 years rotated over these 4 destinations. Maha Kumbh Mela will be held in Haridwar in 2022. Haridwar is referred as the Mayapuri, Gangadwar, Mokhsadwar in ancient writings. 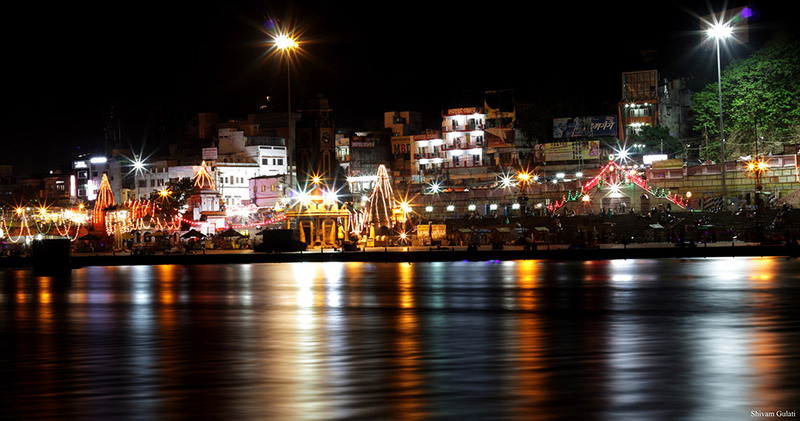 Haridwar serves as the Gateway to the Char Dhams of Uttarakhand. The 'Panch Tirth' or the five pilgrimages located within the periphery of Haridwar are Gangadwara (Har Ki Pauri), Kushwart (Ghat), Kankhal, Bilwa Tirtha (Mansa Devi Temple) and Neel Parvat (Chandi Devi). Other famous attractions include the Chandi Devi temple, Maya Devi temple, Piran Kaliyar, Neel Dhara Pakshi Vihar, Bhimgoda Tank, Bharat Mata Mandir etc. Haridwar is one of the best places to head to if you are in a quest for peace and spirituality. One can do temple hopping, stroll along the river banks, have a holy dip in the Ganges or enjoy the serene atmosphere of the heavenly place. You can visit some of the sacred Hindu temples and ashrams or rejuvenate your senses at the Ayurveda and Yoga centres. The auspicious Ganga Arti held at Har ki Pauri is a sight to behold, as the city is drenched in the divine aura of the glittering diyas and the ambiance is accentuated by the chanting of the mantras to appease the gods. The tiny diyas bedecked by flowers appear as if thousands of lamps are set to float in the river. Haridwar also has a lot in store for the adventure enthusiasts as Rajaji National Park and Rishikesh are located on the outskirts of Haridwar. Haridwar offers some of the most interesting and well-crafted items, carved stone idols, beads, copper and brass puja utensils, glass bangles, cane baskets and jewellery are some of the most popular buying items in Haridwar. But before that, you will really need to know where to go to stuff your bags with these items. Some of the most popular and much visited marketplaces in and around Haridwar are as follows. Bara Bazar: The market is located on the Railway Road. Rudraksha seeds are on display here in plenty. But before you make a buy, do make sure that you are buying genuine seeds. Apart from this, you can buy Ayurvedic medicines as well. Government Handloom & Handicraft Emporium: The pilgrimage town of Haridwar also features a number of government-run emporiums. At these shops, you can find a wide variety of religious as well as stone and wood handicrafts. Moti Bazar: The market lies on the Upper Road towards the north of the canal. Here, you will find a number of stalls in series selling wide range of Pooja articles and other accessories. Once here, you can purchase items including intricately carved stone idols, metal utensils (mainly of copper and brass), sweets, colourful glass bangles and cane baskets. These stalls also sell wonderful kitchen set toys, pickles and Ayurveda medicines. Kankhal:Walking 3 miles south of Haridwar takes you to the historical town of Kankhal. Here you can shop for Rudrakash. Jwalapur:Apart from buying souvenirs at the market here, you can also check out various pure veg restaurants and sweetmeat shops. Shops in the market sell a wide variety of mouth watering delicacies here. Pilgrimage: Haridwar is one of the seven holiest places in India, and lakhs of devotees flock at Haridwar to wash their sins and seek blessings from the divine. People visit Haridwar to perform the last rites of their loved ones. Shopping: There are large number of bazaars where one can purchase devotional items ranging from ornaments, idols and pictures of religious deities. Bara Bazaar and Moti Bazaar are known for their garment shops. Wildlife Safari: The famous Rajaji National Park is just a drive away from Haridwar where one can partake in safari and spot deer, elephants and panthers. If one is lucky, maybe the Royal Bengal tiger will be spotted too. 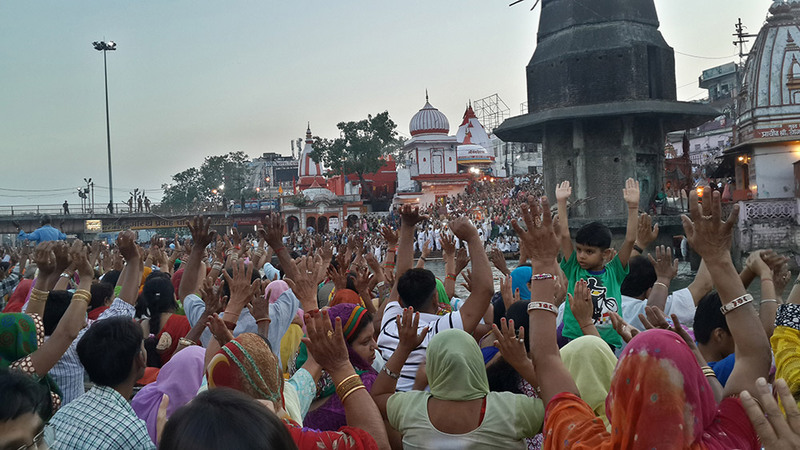 Ganga Aarti that takes place every evening at Har Ki Paudi is a spectacle to remember. One should not miss this while in Haridwar. Photography may be prohibited inside the temple, especially inside sanctum sanctorum. Please abide by the guidelines outlined by temple authorities. 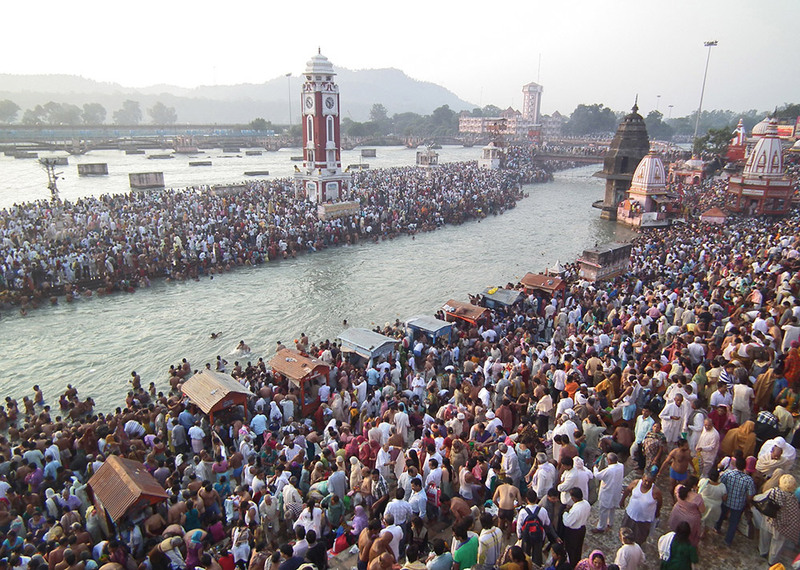 Haridwar gets overcrowded, especially during the Kumbh Mela. 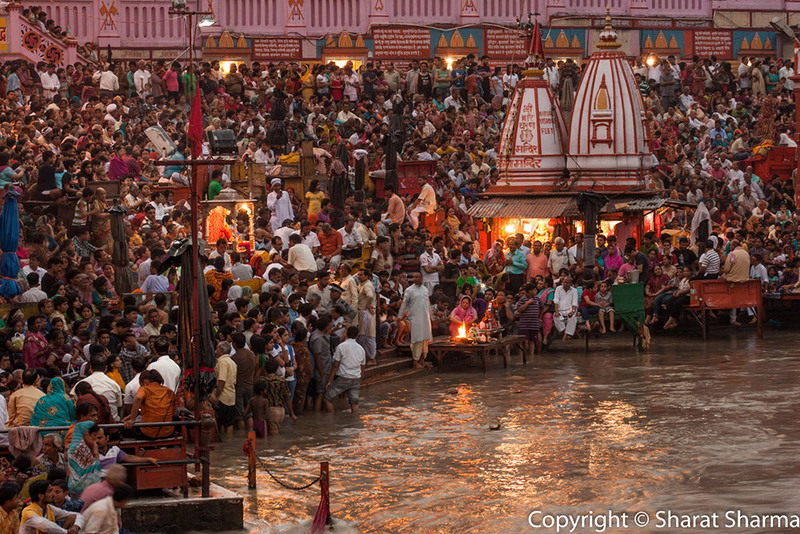 Special care should be taken in that time to avoid getting into large crowds and taking bridges on the river Ganges. Haridwar is one of the most visited pilgrimage place in India. As such,there is no dearth of accommodation options in Haridwar as one can find variety of accommodations a according to his budget. There are many luxurious hotels and resorts available with all modern facilities and amenities. Semi-deluxe and budget guesthouses with limited amenities are peppered all over Haridwar. Being a popular destination both for tourists and pilgrims, there are number of restaurants and eating out places in Haridwar. However, being a place of religious significance, non-vegetarian food and alcohol is prohibited in Haridwar. Luxurious hotels tend to serve variety of cuisines at their in-house restaurant. There are plenty of local restaurants spread all over Haridwar that serve lip-smacking vegetarian dishes. Haridwar is a living example of one such historical city that hasn’t been erased by the tides of time. The city has been mentioned in several Hindu texts, scriptures and books from the times of Buddha to the British invasion. It was ruled by the Maurya Empire (322-185 BCE), followed by the Kushan Empire (c. 1st-3rd centuries). In the Archaeological surveys, it was found that terra cotta culture thrived in Haridwar between 1700 BCE and 1200 BCE. Haridwar also finds its mention in the travel journals of the famous ancient explorers. During King Harshavardhan's rule (590-647) when Chinese traveller, Hsuan Tsang visited India in 629 A.D., he cited Haridwar as ‘Mo-yu-lo’ and also mentioned that there was a temple called 'Gangadwara' which stood in the north of Mo-yu-lo. During the reign of Emperor Jahangir (1596-1627) Thomas Coryat, an English traveller who visited the city mentioned it as ‘Haridwara’, the capital of Lord Shiva. The city was first connected with railways via Laksar, through branch line in 1886. In 2000, Haridwar became a part of Haridwar district of Uttarakhand which was carved out as a separate state from Uttar Pradesh. As per the Hindu mythology, during the Samudra Manthan or the churning of the ocean, the precious drops of elixir or Amrit which carried the boon of immortality were accidentally spilled at four sites i.e Ujjain, Nasik, Allahabad, and Haridwar. To commemorate this event, Kumbh Mela, and Maha Kumbh Mela, the mass Hindu pilgrimages of faith is celebrated once in three years and once in 12 years at one of the four places respectively. It is believed that Brahma Kund situated at Har Ki Pauri is the place where the drops of elixir fell. Haridwar is an ancient city and a Municipality in the Haridwar district of Uttarakhand. It is also the headquarters and the largest city of Haridwar district. Haridwar showcases a vivid topography, with the mighty Himalayas on one side and the plains on the other. This holy city is emerging as a developing industrial estate as the State Industrial Development of Uttarakhand (SIDCUL), Bharat Heavy Electricals Ltd (BHEL) and other affiliated ancillaries are situated here. What is Haridwar famous for? Haridwar is famous among tourist as Pilgrimage. Haridwar is recommended destination for Couples, Foreigners, Groups, Solo. Haridwar is popular destination for following activities/ interests - Business Hub, Char Dham Route, Pilgrimage, Ropeways, Temples, Weekend Getaway.